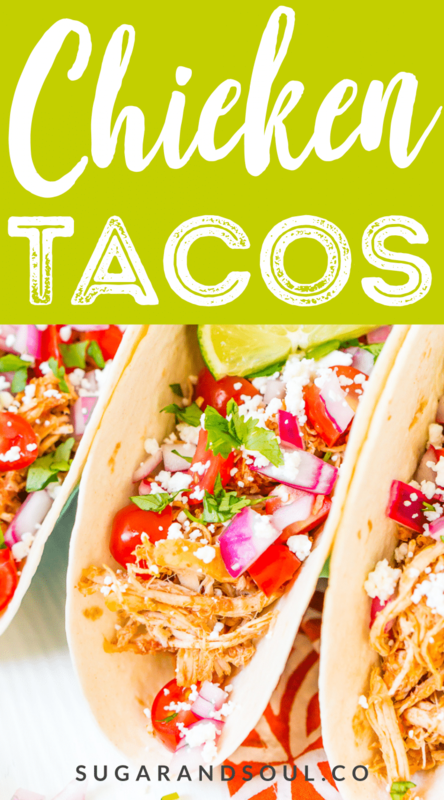 This Chicken Tacos recipe is a sponsored post written by me on behalf of Mission®. All opinions are entirely my own. 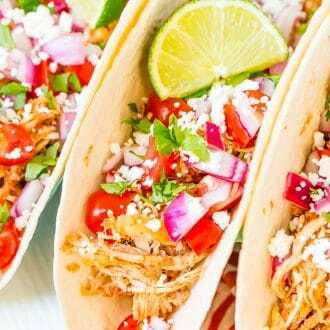 These Shredded Chicken Tacos are an easy and flavorful dinner to enjoy with friends and family. The chicken is loaded with spices and topped with fresh veggies and cheese all wrapped in a super soft flour tortilla. I love summertime for so many reasons: the food, the sunshine, the freedom, but most of all, for spending time with friends and family! Saturday nights are Game Nights in our circle of friends and that means that easy dinners like these chicken tacos are an absolute must! Mainers know that the nice weather is fleeting, so we take advantage of the warmer months by heading outside as much as we can! Since moving to our new house, my husband Matt and I have a cozy patio that’s perfect for hosting guests or just enjoying dinner for two. A blend of zesty Mexican spices make this dish extra flavorful, and the combination of tender meat and cool veggies wrapped in a pillowy Mission® Super Soft Flour Tortillas will make your mouth water! And as much as we like making meals on the grill — I mean, who doesn’t? — after a while, the old hamburgers-and-hot-dogs routine can get a little old. 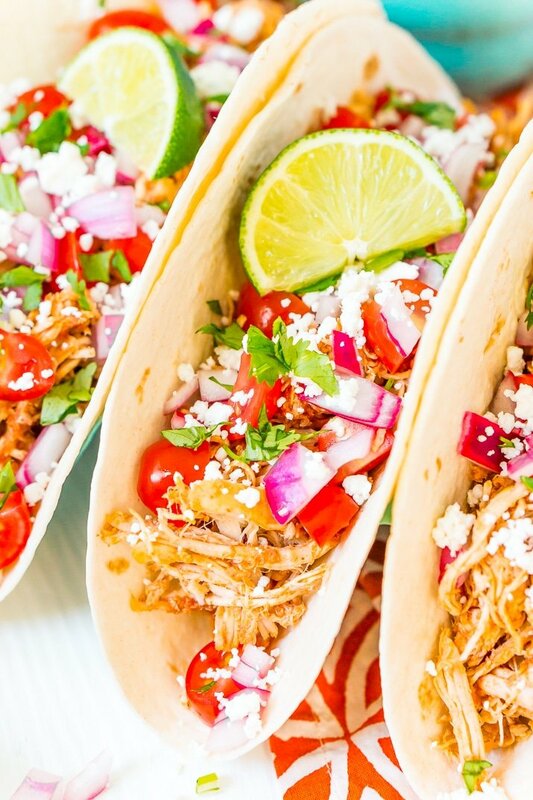 That’s why, inspired by my trip to Mexico last year, I came up with these Shredded Chicken Tacos Recipe, a perfect dinner to enjoy on a balmy evening. One of the best parts about this recipe is that it’s so easy, it barely requires any hands-on time. The chicken is made in a slow cooker, so you won’t have to stand near a hot stove or grill during the hottest part of the summer. This is also perfect because it means that our protein can stay hot while guests arrive and I can prep the other ingredients well in advance. This chicken taco recipe is perfect to serve friends and family while relaxing on the patio. For one, hands-off cooking means less time spent in the kitchen, and more time mingling with loved ones. What’s more, you can really be creative when serving these festive tacos. For our first gathering of the season and in our new house, I plan on setting up a make-your-own taco bar so everyone can fill their Mission tortillas exactly as they please! 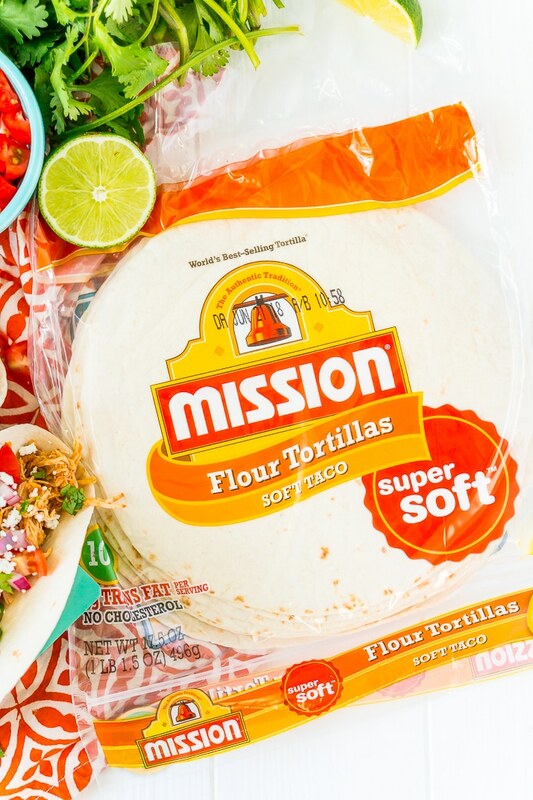 Mission Super Soft Flour Tortillas are available nationwide and can be found in the bread or tortilla aisle. You can visit the Mission site to use the store locator and find even more delicious recipes using Mission tortillas. 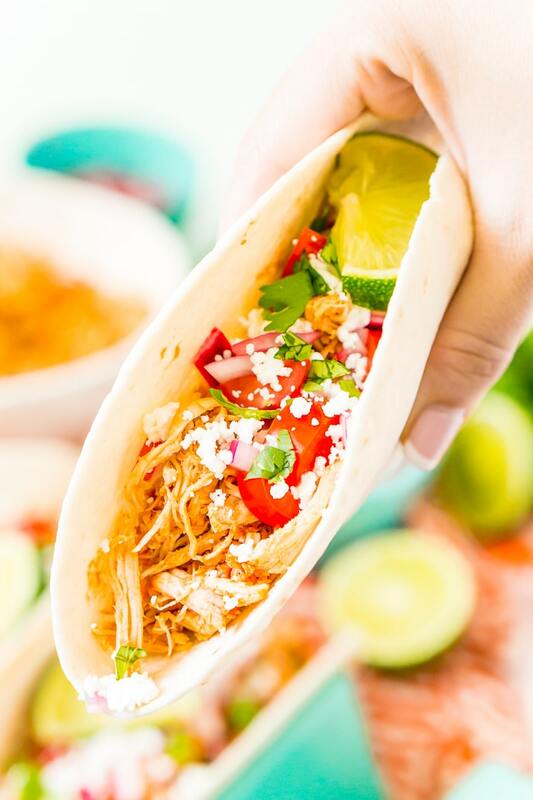 There are all sorts of ways to dress up Shredded Chicken Tacos, and setting all the toppings on a table will allow you and your guests to customize their own plates. I’ll have bowls full of shredded lettuce and diced tomato, sliced onion, Cotija cheese, creamy avocados, sweet corn, lime wedges, fresh cilantro, salsa, sour cream, and hot sauce! The possibilities are endless! And of course, the buffet line will begin with a plate of Mission Super Soft Flour Tortillas, either warmed in the microwave or toasted on the grill. The key to making truly scrumptious tacos every time you make them is to have premium ingredients. In addition to juicy Mexican chicken and summer-fresh vegetables, Mission Super Soft Flour Tortillas are hands-down my tortillas of choice; after all, they’re the foundation of the dish! These tortillas are thick enough to hold in all your creamiest, juiciest ingredients, but your teeth will sink right into their light-as-air texture! Warm them up just before serving (directions are on the package), and they’re even softer and more flavorful. 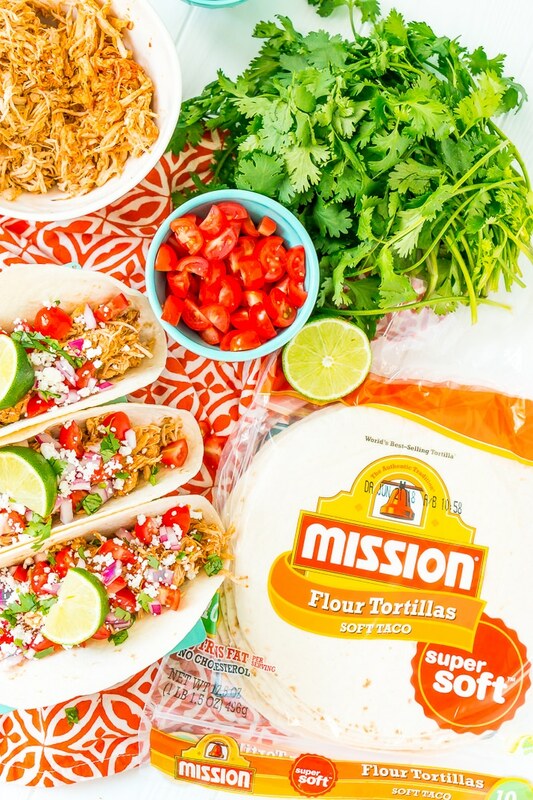 I always opt for Mission brand products in my Mexican-inspired recipes because tasty ingredients make for the tastiest dishes! 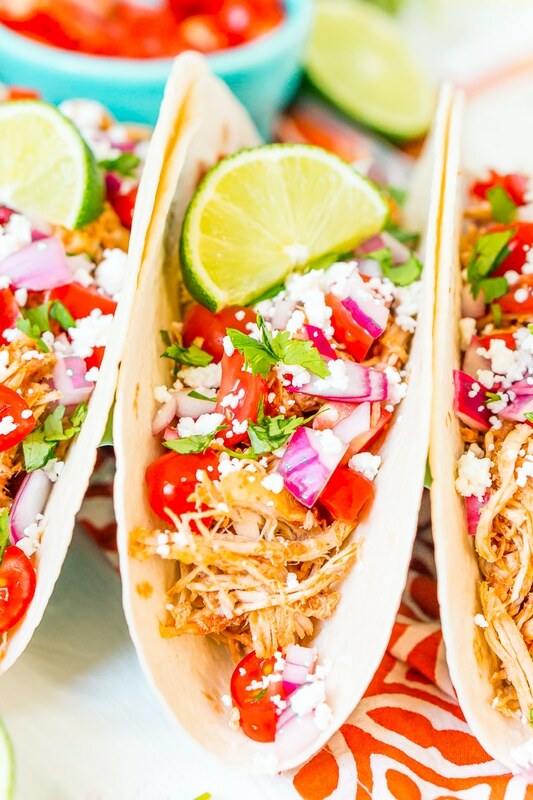 Shredded Chicken Tacos can make any night feel like a fiesta, especially if you take them outside! Matt and I love Mexican food, and we love leftovers, and this recipe gives us both. 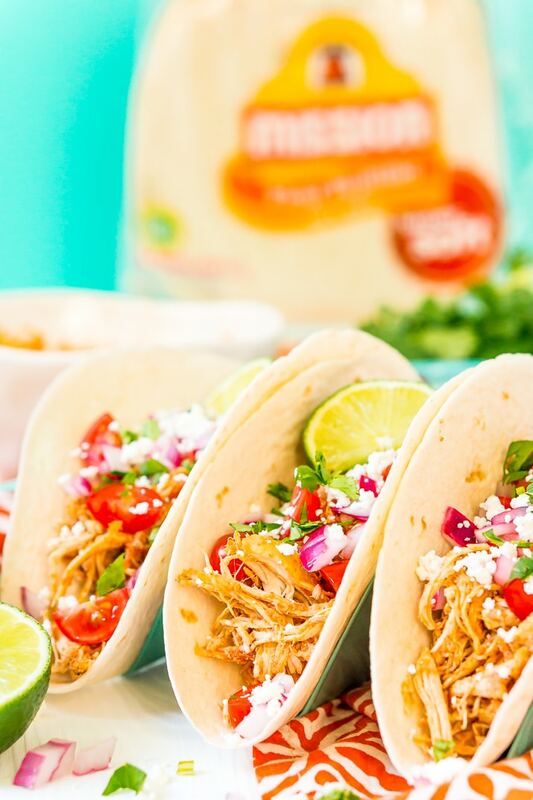 Slow cooked chicken tastes delicious a day or two later, and we always have an open bag of Mission flour tortillas in the pantry. So if we do have extras, we oftentimes make quesadillas the next day! If you want a satisfying dinner that’ll stretch for a few evenings, especially during the dog days of summer when you don’t want to turn on the oven, this recipe is perfect. And a note to parents of picky kids: you’ll hear a lot less complaining when they’re able to choose their own taco toppings! Here in New England, summer is short, so we have to celebrate each gorgeous day as it comes. What’s your favorite way to spend summer nights? Is it playing board games with friends with piles of tasty Mexican food or maybe it’s a night at the drive-in with an easy dinner beforehand? Either way, you’re in for a treat with this recipe! Pin this Chicken Taco Recipe for Later! Add the chicken, canned tomatoes, green chilies, and chicken spices to a slow cooker and cook on high for 4 hours. Remove the chicken to shred and then add back to the slow cooker and cook for an additional 30 minutes. Meanwhile, prepare the paste by mixing together all of the sauce ingredients, cover and set aside until ready to use. Dice the onion and place it in a small bowl with the vinegar, sugar, and salt and place in the refrigerator to pickle. Prepare the remaining toppings and set aside until needed. Once the chicken has finished cooking, transfer it to a large bowl and mix with the paste until combined. Warm the Mission Super Soft Flour Tortillas according to package directions. Top warm tortillas with prepared chicken and toppings and enjoy. 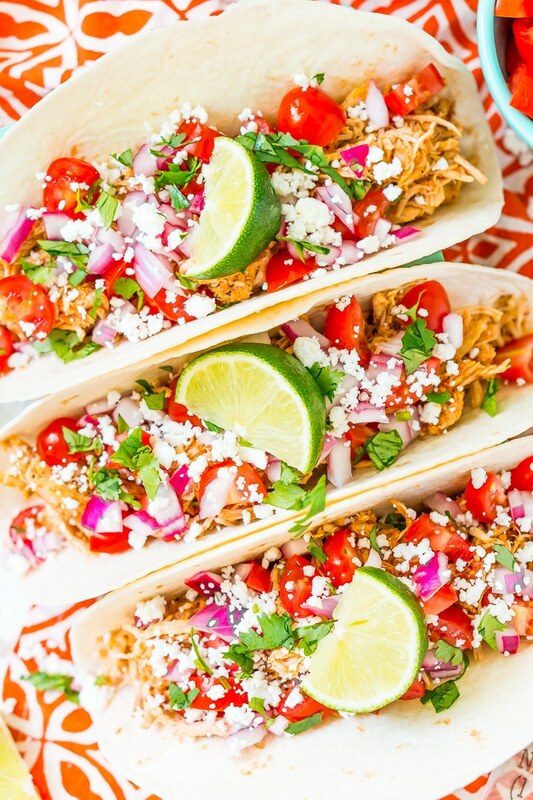 These chicken tacos look fabulous! I love chicken tacos! This recipe looks amazing!